With an initial flight date of May 17, 1946, the Douglas XB-43 has the distinction of being the first jet-powered bomber to fly in the United States. Derived from the earlier propeller-driven XB-42, the XB-43 served as a useful test bed for several years but offered insufficient capability to warrant production. Prototypes of five, more capable, higher performance jet bombers were flown in 1947; two of these, the North American B-45 and the Boeing B-47, were selected for production. The two aircraft are described in the following paragraphs. With a first-flight date of March 17, 1947, the North American B-45 Tornado was the first jet-powered bomber to be put into production  in the United States and the first to enter operational service with the USAF. Two views of a B-45A are shown in figures 12.1 and 12.2, and physical and performance data for the more capable B-45C are given in table VI. The C model differed from earlier models of the B-45 in several respects; the most obvious difference in the appearance of the C model was the 1200-gallon fuel tank mounted at each wingtip. The configuration of the B-45 is reminiscent of' a World War II bomber equipped with jet engines instead of propellers driven by reciprocating power plants. The unswept wing had an average airfoil thickness ratio of about 14 percent and was equipped with trailing-edge single-slotted flaps for lift augmentation in landing and takeoff. Lateral control was accomplished with the use of conventional ailerons. ...NACA and pictured in figure 12.2, was probably caused by this combination of circumstances that resulted in a normal load factor far greater than the design value. The technology of power-assisted controls was in its infancy at the time of development of the B-45, and much was yet to be learned about the effective and safe application of such control techniques. ...important lessons applicable to the design of later jet-powered bomber aircraft. Manned by a crew of four, the B-45 had two pilots seated in tandem under a transparent canopy, a bombardier located in the nose, and a tail gunner. Only the pilots were equipped with ejection seats. In an emergency, the bombardier, located in the nose of the aircraft, was expected to evacuate through a hatch located in the side of the fuselage. To minimize the hazards associated with the high-velocity airstream, a fuselage flap was deployed ahead of the hatch to deflect the airstream away from the exiting bombardier. An escape hatch with deflector flaps was also provided for the tail gunner. Environmental control for the crew included pressurization, heating, and cooling. With a gross weight of 110 050 pounds, the B-45 was in the same weight class as the wartime Boeing B-29 (chapter 5) but had a maximum speed advantage over the B-29 of more than 200 miles per hour. A 10 000-pound weapon load could be delivered by the B-45 at a mission radius of 1008 miles. Ferry range of the aircraft was 2426 miles. 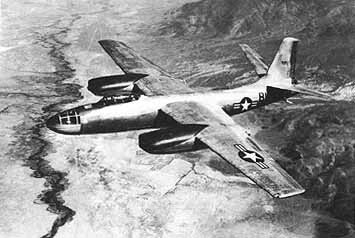 The maximum lift-drag ratio of the B-45 was 16.3, about the same as that of the B-29, and its zero-lift drag coefficient was a much lower 0.0160 as compared with 0.0241 for the earlier aircraft. The Tornado first entered service with the Strategic Air Command in November 1948, and final retirement of the type from operational service took place in 1958. Total production consisted of 139 units. In concept, the Boeing B-47 was as revolutionary as the North American B-45 was conventional. The Stratojet was far ahead of any contemporary bomber in its performance and operational capability. A total of 2041 of these aircraft were manufactured, more than any other United States bomber built under peacetime conditions. As a key element in the Strategic Air Command, the B-47 served in operational squadrons until withdrawn from service in 1966. The aircraft was used for various types of special operations, however, for at least another 10 years. 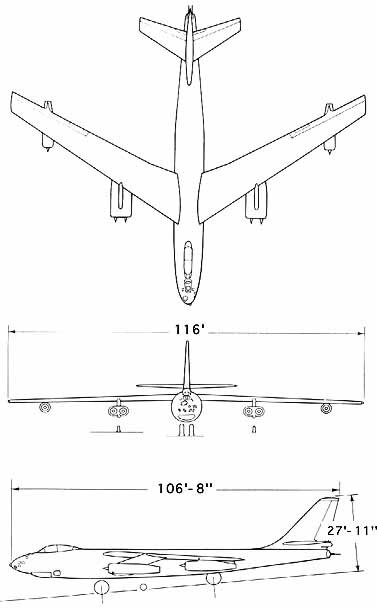 A three-view drawing of the B-47E is shown in figure 12.3, and photographs of the aircraft are presented in figures 12.4, 12.5, and 12.6. Physical and performance data for the definitive version of the aircraft, the B-47E, are given in table VI. The configuration of the aircraft is characterized by (1) a thin, high-aspect-ratio sweptback wing mounted in the shoulder position near the top of the fuselage, (2) six jet engines mounted in pods beneath the wing, and (3) an unusual bicycle-type landing gear. Design of the wing featured an average thickness ratio of about 12 percent, an aspect ratio of 9.42, and a sweepback angle of 35°. Single-slotted flaps located at the trailing edge provided high lift for landing, and conventional ailerons were used for lateral control. All control surfaces were hydraulically boosted. Location of the wing near the top of the fuselage allowed the bomb load to be carried in the fuselage, beneath the wing and near the center of gravity, and to be released through doors in the bottom of the fuselage without interference from the structure of' the wing center section. Further, the shoulder position of the wing allowed adequate ground clearance for the engine nacelles. ....front of and behind the bomb bay. Small, retractable outrigger wheels extended from the inboard nacelles to assist in providing lateral balance while the aircraft was on the ground. The front bogie was steerable to give ground maneuverability. Details of the landing gear can be seen in figure 12.6. The engine nacelles are widely separated from each other and the fuselage. Thus, the danger to the aircraft and other engines that results from the disintegration of one engine is reduced. This advantage is somewhat nullified in the B-47 because two of the nacelles contain two engines. The aircraft is easy to balance because the engines can be located near the aircraft center of gravity. The weight of the engines mounted outboard on the wing reduces the wing bending moments in flight. The engines are easy to maintain and can be readily removed because of their proximity to the ground. Since the engine inlets are usually outboard of the spray pattern from the nose and main landing gear, the outboard wing mounting offers good protection from FOD (foreign object damage) to the engines when the aircraft is operated on the ground. Failure of an engine, particularly during takeoff or climb, may produce large yawing moments that require immediate correction by the pilot. The magnitude of the corrective yawing moments required to counteract the unsymmetrical  thrust in the engine-out condition may determine the necessary size of the rudder. A small reduction in maximum lift coefficient may result from unfavorable interference effects in the nacelle-wing juncture and from the impingement of the nacelle wake on the wing at high lift coefficients. 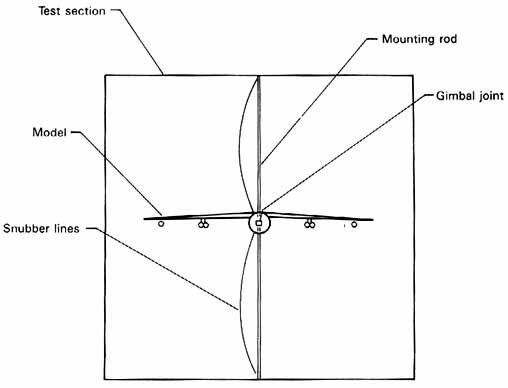 The wing-nacelle-pylon relationships must also be carefully tailored, usually in wind-tunnel studies, to eliminate or minimize any interference drag. A positive aerodynamic benefit, however, results from the pylons, which act somewhat like wing fences in alleviating the pitch-up problem so often found in aircraft with sweptback wings. The addition of concentrated weights, such as engines or stores, is usually thought to reduce the wing flutter speed. The relationship of the engine center of gravity to the wing elastic axis as well as the dynamic coupling between the engines and the wing strongly influence the effect of the engines on the wing flutter speed. These, as well as other relationships, must be carefully tailored by a detailed process involving mathematical analysis and wind-tunnel tests. By this means, a reduction in flutter speed can usually be avoided. The dynamic loads imposed on the wing structure during operations on the ground are usually intensified by the concentrated engine masses mounted on the wings. The thin, high-aspect-ratio swept wing of the B-47 coupled with its long high-fineness-ratio fuselage contributed to the high aerodynamic efficiency of the aircraft. The maximum lift-drag ratio of about 20 is the highest of any aircraft yet considered in this book, and the zero-lift drag coefficient was a low 0.0148. Maximum speed is given in table VI as 607 miles per hour at 16 300 feet; the corresponding Mach number is 0.85, which is nearly 0.1 higher than that of the B-45. The very features that contributed to the high performance of the B-47, however, also introduced some new problems that have been present in the development of all subsequent large jet-powered multiengine aircraft. Aeroelasticity, the interaction of aerodynamic, elastic, and inertial forces, has formed a branch of aeronautical engineering for many years. Because of the flexibility of the long, thin elements of the B-47,  however, the need to consider aeroelastic effects in the basic aircraft design process assumed critical importance. For example, in static tests the total deflection of the B-47 wingtip was 17 feet from maximum positive to negative deflection. Areas in which aeroelasticity are important are stability, control, loads, and, of course, flutter. Flutter is a phenomenon in which an aircraft or one of its components, such as a wing or control surface, extracts energy from the moving airstream and converts it to a harmonic oscillation of the structure that may grow in amplitude until total destruction occurs. Flutter analysis and prediction is an arcane science in which flutter prediction and design for its avoidance have historically been the subject of detailed mathematical analysis. Uncertainties as to the nature of oscillating air forces, however, as well as the complex participation of the entire aircraft in the various structural vibration modes made mandatory the development of new experimental wind-tunnel techniques for studying these phenomena during development of the B-47. Flutter tests and analyses had usually been limited to individual components of the aircraft such as the wing plus aileron or horizontal and vertical tail surfaces. The aircraft as an entity was usually not considered in the determination of the critical flutter speed, nor was such consideration necessary. However, the concentration of large masses beneath the wings, together with the high degree of flexibility of the wings and other components of the aircraft, required that motions of the complete airplane be considered in determining the critical flutter speeds of the B-47. Both symmetrical and antisymmetrical flutter modes needed to be studied. In a symmetrical mode, each wing deforms in exactly the same way, and the motion of the wings is accompanied by a vertical, up-and-down, and pitching motion of the fuselage. In antisymmetrical flutter, the wings on either side of the fuselage deform in exactly opposite directions, and the wing motion is accompanied by a rolling and yawing of the fuselage. Figure 12.7 - Sketch of flutter model mounted in wind-tunnel test section. ...model was trimmed so that the lift force balanced the weight of the model. Pitch trim was maintained as the tunnel speed varied by remote adjustment of a tab on the horizontal tall. Limited rolling freedom was provided by looseness in the gimbal joint and flexibility in the mounting rod. The model was constructed in such a way as to simulate the stiffness and mass properties of the aircraft and, accordingly, was quite complex and expensive to design and build. The technique illustrated in figure 12.7 was successfully employed in the development of the B-47 as a means for identifying flutter-critical combinations of speed and altitude and development of design fixes for flutter avoidance. A detailed description of the technique is given in reference 173. The mounting rod limits the usefulness of the technique to fairly low subsonic speeds because of aerodynamic interference effects associated with the formation of shock waves on the rod at high subsonic Mach numbers. The complete model flutter tests made on the B-47 were carried out in a low-speed wind tunnel, and the results were then adjusted for estimated Mach number effects. Later techniques developed by NACA and NASA allow flutter tests of complete airplane  models to be made at high subsonic and transonic Mach numbers in a wind tunnel especially designed for high-speed flutter investigations. Along with this rather general discussion of various engineering aspects of the B-47, a few more specific features of its design should be pointed out. The aircraft was manned by a crew of three. Two pilots sat in a tandem arrangement under a bubble-type canopy in a manner similar to that of a fighter; a bombardier-navigator sat in an enclosed compartment located in the nose of the aircraft. Upward-firing ejection seats were provided for the pilots, and the bombardier was equipped with a downward-firing ejection seat. Crew compartments were heated, ventilated, and pressurized. As fast or faster than most fighters, the Stratojet was equipped with only two 20-mm cannons situated in a remotely controlled turret located in the tail of the aircraft. Aiming and firing of these guns was the duty of the copilot whose seat could be rotated 180° to face rearward. 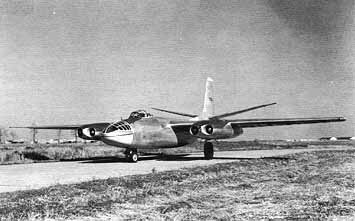 For assistance in the landing maneuver, the B-47 was equipped with a drag chute that was deployed during the approach. The added drag of the parachute aided in controlling the speed and the flight-path angle during this phase of the landing maneuver. Once on the runway, a large braking chute was deployed to assist in stopping the aircraft. An interesting insight into the airport performance of the B-47 is provided by a comparison of its stalling speed of 175 miles per hour with the cruising speed of 182 miles per hour given in chapter 4 for the World War II B-17G. Not surprisingly, the length of hard-surface runways at military air fields increased dramatically in the years following World War II. Although the B-47 was equipped with six 7200-pound-thrust (with water injection) turbojet engines, the thrust-to-weight ratio at maximum gross weight was only 0.22, which, coupled with its high stalling speed, resulted in a long takeoff ground roll. To reduce the takeoff field length, the aircraft was initially equipped with 18 short-duration booster rockets. These units were an integral part of the aircraft and were known by the acronym JATO (jet-assisted takeoff). Nine JATO nozzles were located on each side of the fuselage; they may be seen in figure 12.4 just ahead of the national insignia. On some later versions of the aircraft, weight was saved by replacing the integral JATO units with a jettisonable external rack containing the rockets. In this installation, 33 rockets of 1000 pounds thrust each were provided. 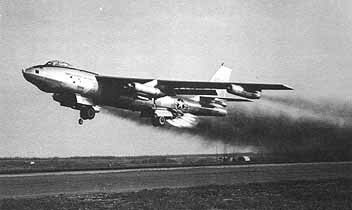 A B-47 taking off with a boost from the external JATO pack is shown in figure 12.5. By post-World War II standards, the B-47 was classified as a medium bomber; but with a gross weight of 198 180 pounds, the B-47E was far heavier than any bomber flown in World War II (the gross weight of the B-29 was 120 000 pounds), and it ranked second only to the 357 500-pound B-36D as the heaviest aircraft operated by the USAF in the early 1950's. 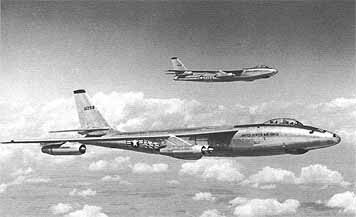 Designed as a strategic bomber, the B-47 also filled various other roles such as photoreconnaissance. In its design role as a strategic bomber, the B-47 could deliver a 10 845-pound weapons load at a mission radius of 2013 miles. Ferry range was 4035 miles (table VI). With air-to-air refueling, which became standard operating procedure following the close of World War II, both the mission radius and the ferry range were greatly increased, and targets in Eastern Europe could be reached from bases in the United States with sufficient range potential to allow safe return to friendly territory. In the strategic bombing role for which the B-47 was designed, weapons delivery at the target was originally intended to take place from high altitudes. By the mid-1950's, however, the increasing effectiveness of methods for detecting aircraft at high attitudes, as well as the growing capability of surface-to-air missiles and fighter aircraft, required the development of new methods of weapons delivery. As a means of avoiding detection by radar, penetration of enemy airspace was to take place at high speed and at an altitude of only a few hundred feet. At the target, the aircraft was to execute an Immelmann turn with weapons delivery taking place in near vertical flight. (An Immelmann turn consists of a half loop followed by a half roll from inverted to normal flight attitude at the top of the loop. A change of 180° in direction coupled with a gain in altitude are accomplished during the maneuver.) This method of weapons delivery was known as LABS (lowaltitude bombing system) and was intended to provide the aircraft a means for escaping destruction from the blast effects of its own weapon. Constant practice of the LABS technique subjected the B-47 fleet to the severe gust-load environment of high-speed low-altitude flight, as well as the maneuver loads associated with weapons delivery. The aircraft was not designed for this type of service. As a consequence structural fatigue problems were encountered, and several aircraft were lost as a result of structural failure. 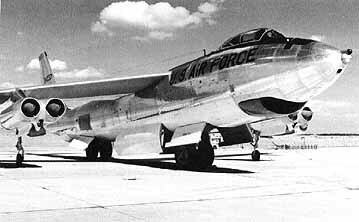 At one point, the entire B-47 flee was grounded for inspection and incorporation of necessary design modifications. Both the structural fatigue problem and the much greater capability of the Boeing B-52, which began entering the inventory in 1955, played a part in the retirement of the B-47 from first-line service. Its life with the Strategic Air Command began in 1951 and ended 15 years later in 1966. The Boeing B-47 should be viewed as a landmark aircraft that established a new technical plateau for large, multiengine, jet-powered aircraft.